Cool photo! And you have some absolutely phenomenal photos on this site. But just a little correction on this one: Defensa street is in San Telmo not Recoleta though both are very popular barrios among tourists. (HK:) thanks Jeff, of course, you are right, changed it! Great Photo, Been to San Telmo many times for the low price steaks. Cool, I love the wide angle! Different from most tourist shots. Cool work! 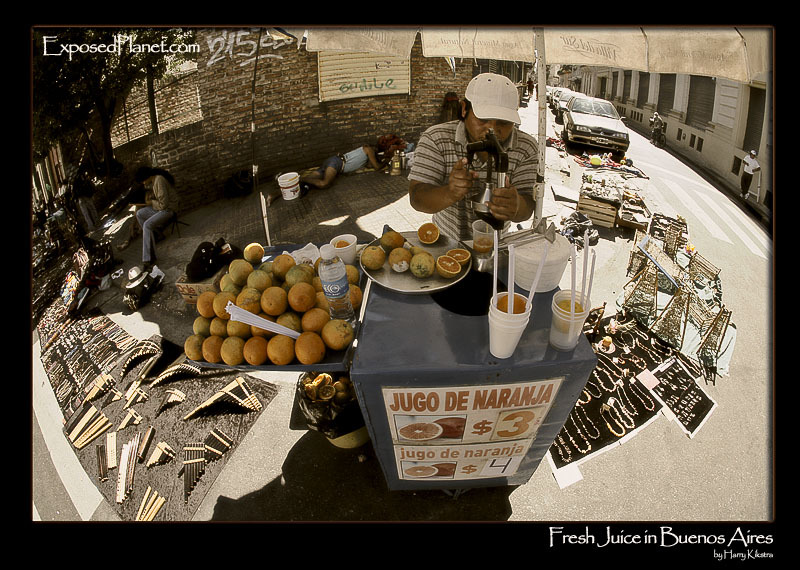 The story behind "Fresh Juice in Buenos Aires"
You might see some more of this 15mm fish-eye in the future, though it distorts (actually, that is the point), I like it a lot. This was taken on busy Defensa street in Buenos Aires’ deservingly popular San Telmo district (not Recoleta as previously mentioned, thanks to the comment of Jeff, below!). Filled with antique shops and tourists during the day and nice bars and restaurants (and tourists) in the evening, it is a great place to visit.